As it’s the festive season and all that, I thought I’d show you something really strange I found in Barcelona last summer. 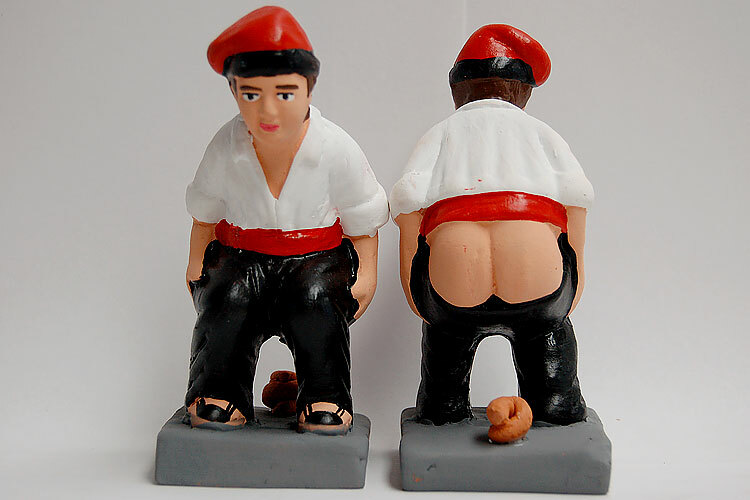 El Caganer, literally translated as “the crapper”, is a Christmas character who’s been part of Catalan culture for over 400 years. He’s often depicted as a peasant, wearing his traditional Catalan red hat and is bent over, with his pants down, right in the middle of doing a massive poo! Yep, and would you believe me if I told you that El Caganer actually plays a major role in Christmas celebrations over there? Nearly everyone has a statue of him and he often finds his way into nativity scenes; he’s situated somewhere near baby Jesus’ inn, where everyone can gaze lovingly at him while he does his dirty business. You might be wondering, like I was when I first heard of this, if it’s some kind of mass-scale Spanish troll. However, I asked my friend Alex, who’s lived his whole life in Barcelona and he assured me, in all seriousness, that El Caganer is as wholesome and Christmasy as Saint Nick. And it gets weirder. You see, The Caganer isn’t the only Christmas poo celebrated by the Catalans. 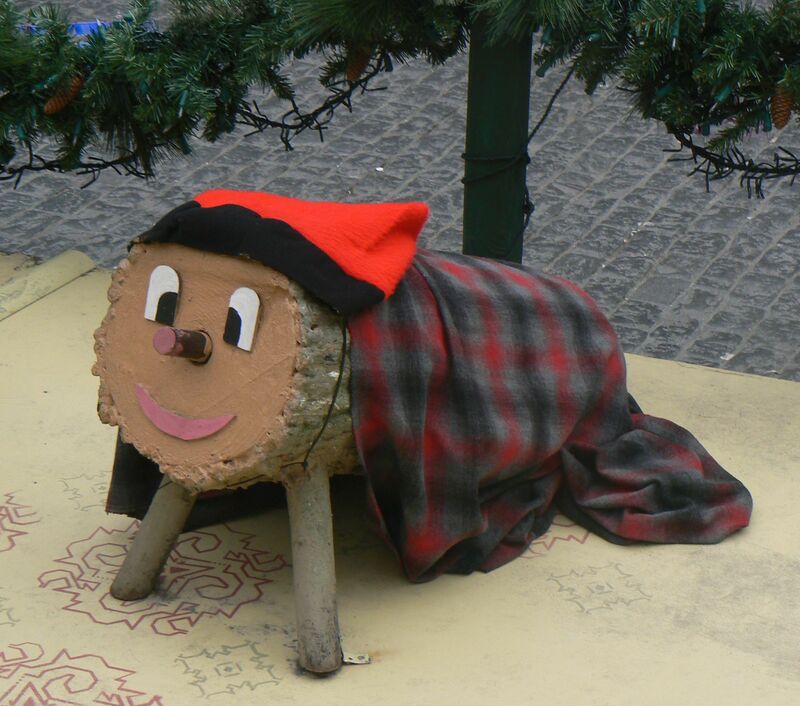 There’s also Tió de Nadal or “The Christmas Log”: a hollow piece of wood with legs and a face which poos out children’s presents on Christmas day. Yep, that’s right, it poos out the gifts people! At the feast of the Immaculate Conception (Dec 8th), children give the log something to ‘eat’ and then cover it with a blanket so it doesn’t get cold. They do this every night until Christmas Eve (or Christmas day), when they hit the log with a stick and sing songs to encourage it to poo. Then the kids go into another room and pray for the log to poo while the parents put some presents under the blanket. When the children come back they lift up the blanket and bobs your uncle: poo presents. Although there’s loads of conflicting theories about where these quirky traditions come from, the one I really liked is the one our Barcelona tour guide mentioned. She explained that the focus on poo in Catalan Christmas is a celebration of the cyclical nature of life itself. Healthy manure is essential for a good harvest, a good harvest is in turn needed so we can have lots of tasty food. And delicious food is, of course, really important for a happy Christmas! This will in turn become good manure again (or at least it would if we followed The Caganer’s lead and took a poo outside… there’s something for you to consider over the holiday season after a few too many roast spuds). Seriously though, is it just me or is there something strangely beautiful about that? I think any Christmas tradition that celebrates our connection to nature is alright in my books. Especially at a time when we’re wasting so many precious resources and polluting the earth, all so we can exchange trillions of plastic nick-knacks in a mince pie fueled frenzy. But Christmas in Barcelona isn’t some sort of poo utopia, mind. In true consumerist fashion, there’s now hundreds of different types of Caganer you can buy, including one that looks like Prince William and one that looks like Obama. And they’re extortionately expensive. Happy holidays! Red is the New Blue Returns!